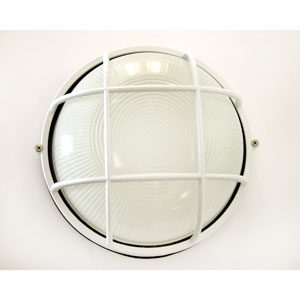 The RCA Cast Aluminum Bulkhead is available in two sizes: 10” and 14”. This fixture comes in Compact Fluorescent (CFL), HID, Induction, and now available in LED. Can be supplied with or without cast guard. Standard with frosted glass lens. Polycarbonate lenses available on 14” fixtures in three styles. Fully-gasketed housing. For wall or ceiling mount. Specify open face, eyelid face, or cross grid guard. Guards are die cast aluminum, held with two standard screws. Optional tamperproof screws available. Energy saving and electronic class P, HPF ballasts comply with Federal Energy Efficiency standards. Compact fluorescent ballasts are <10% THD and include 5 year manufacturer’s warranty. 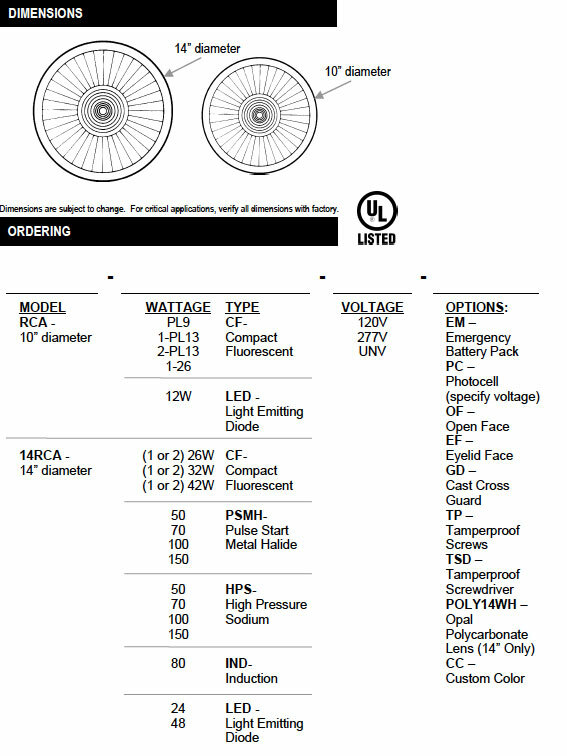 Ballasts operate on 120-277V (UNV) unless otherwise specified. Specify white, black, bronze, or titanium polyester powder coat finish. Optional custom colors available.